A BART spokeswoman said a man, who a rider said was wearing a Santa hat and threatened to kill him while passing out anti-Semitic leaflets on cars at the Lafayette station, will not be charged with disturbing the peace. Alicia Trost told NBC Bay Area that a BART officer went before the Contra Costa County District Attorney on Friday and presented facts, and that the DA did not charge the man with the reasoning of Freedom of Speech. Trost said the transit agency's investigator took seriously what a BART rider told him this week about feeling threatened. The investigator was recommending charges be filed. @topmom100@ADL_National@splcenter Appellate court case law shows we can not prohibit free speech leafleting on windshields at BART. NBC Bay Area first reported this story on Tuesday and obtained a photograph of the man in the Santa hat from the BART rider who said he felt threatened. NBC Bay Area is not naming that rider because he is active in the Jewish community and fears retribution from the man in the Santa hat if he is identified. The rider did provide a photo of the suspect to NBC Bay Area. Trost confirmed that the man in the Santa hat is the same man being investigated. According to that rider, the man in the Santa hat was plastering cars with anti-Semitic fliers in the Lafayette BART parking lot on Wednesday about 5 p.m. when he asked him to stop. The hundreds of fliers are non-sensical rants about Jews being baby killers and serpents. There are also website addresses on the fliers which seem to single out specific Jewis in Lafayette. The fliers were also spotted by other riders on Tuesday evening, but BART said at that point there was nothing the public agency could do. According to the 9th Circuit Court of Appeals, the leaf-letting, no matter how distasteful, is considered free speech and can't be legally prevented on BART property, according to American Civil Liberties Union attorney Michael Risher. But the situation escalated between the man in the Santa hat and this particular BART rider, who told NBC Bay Area he also gave video testimony to BART police and provided a police report number to bolster his account. 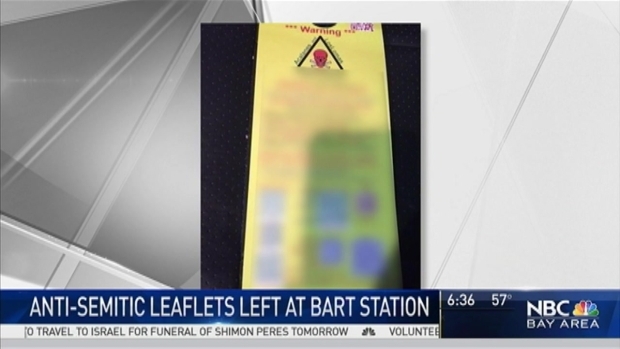 Jewish community members are rattled and annoyed after finding about a hundred anti-semitic fliers pinned to car windshields at the Lafayette BART Station. Kris Sanchez reports. The BART rider, who happens to be a high-profile member of the American Israel Public Affairs Committee, told the man in the Santa hat to remove the fliers from his car. "Hey buddy, you can't do that," the BART rider told NBC Bay Area in a phone interview Thursday morning. The man in the Santa hat answered: "You f---ing Jew, you baby killer. I'm going to kill you," according to the BART rider. Then the Jewish BART rider asked the man in the Santa hat to pose. "I told him I wanted to take a picture of an anti-Semite," the BART rider said. The man complied for a moment, which is when the rider snapped a photo as well as the license plate number on his Mazda pickup, where the man was going to get more fliers, and reported it to police. The officer took the threats very seriously, the rider said. NBC Bay Area's Gillian Edevane contributed to this report.